Jacinda Ardern used to be a DJ, and we have photos. 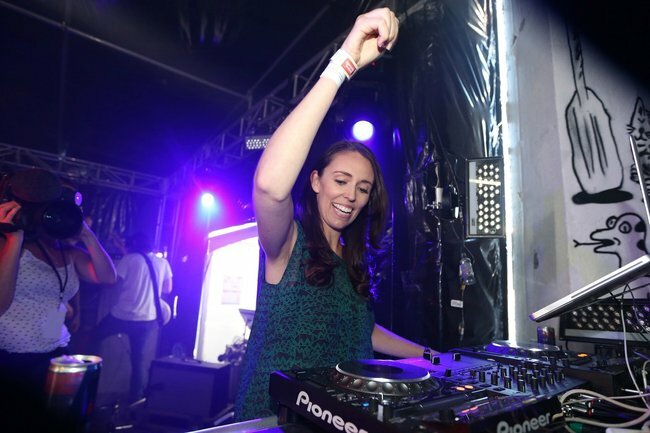 Jacinda Ardern used to be a DJ, and we're starting to think there's nothing she can't do. Jacinda Ardern is the leader of the moment right now, as the world watches on in awe at her exceptional response to the horrific Christchurch terror attacks that killed 50 people and injured dozens more. The New Zealand Prime Minister has re-ignited our hope in leadership, and been a token of compassion, grace and strength in what has been an incredibly tough week for her country. But before Jacinda Ardern was a Prime Minister, she carried a different name…DJ. Watch this video about Jacinda’s leadership. Post continues after video. Jacinda at Laneway Auckland. Picture: Getty. In 2018 she revisited the festival and reminisced on her days as a DJ telling the crowd; "I remember that so well because I have permanent hearing damage through my left ear as a consequence and it was amazing to be a part of a festival that is so intrinsically Auckland, so wonderful," Ms Ardern said. She went on to say: "never give up on the importance of supporting creatives and artists live", saying live performing is "the fuel for the creative machine". It&apos;s not the only evidence of DJ Ardern, an Instagram post from 2013 shows the now Prime Minister in a retro singlet, spinning the decks at a record store event. “There’s still time to come join record store day festivities at Real Groovy! Thankfully, you’ll miss my attempt at being a DJ,” she wrote. She returned to the event the following year. "Thanks for letting me come play. Got my first ever request (and no, I don&apos;t own any Jimmy Barnes on vinyl)," says the caption. While Ms Ardern never took her hobby professional, she did play at a friend&apos;s wedding reports New Zealand music website Spin Off. 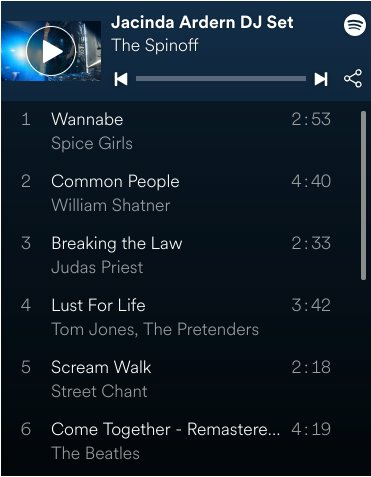 The publication has also put together a Spotify list based on some of the tracks DJ Ardern used to bust out. It includes everything from the Spice Girls to The Beatles to The Pretenders. 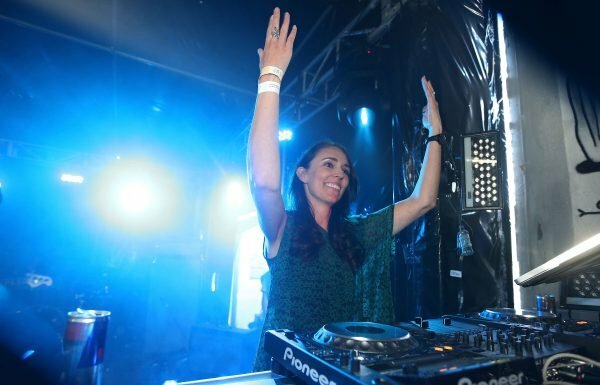 A NZ publication has compiled a Jacinda Ardern DJ set. Image: Spin Off. Since her DJ days, Ardern has forged a highly successful political career, winning the election in October 2017 to become the world&apos;s youngest female leader at 37. In January she announced she was expecting her first baby with her partner Clarke Gayford. She returned to public life after six weeks maternity leave, while Gayford took on the role of stay-at-home dad. Last week&apos;s terror attacks at two Christchurch mosques has been her biggest political challenge to date. In the past week she has been applauded worldwide for her handling of the atrocities. She acted swiftly and with the utmost compassion towards the victims and their families, immediately donning a hijab in solidarity. She refused to name the gunman, displayed genuine empathy, and most importantly banned all military style weapons and all semi-automatic weapons with immediate effect. Why the world can&apos;t look away from Jacinda Ardern in the wake of the Christchurch attack.